A Seal’s Eye View of our World, a word from the founder of the Irish Seal Sanctuary. 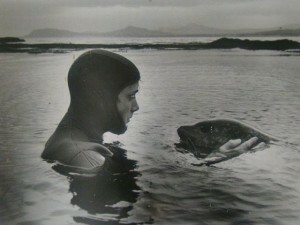 Over 3 decades on from our 1st orphan Whitecoat ( Grey Seal newborn and World’s 1st Protected species) rescues, failures and ultimate successful releases to wild and over a 1000 animals later, the Irish Seal Sanctuary remains as necessary as in those early years, empowering coastal folk and communities in the care and protection of their environment, wildlife, fisheries and ultimately sustainable communities. Seals have reflected human progress and our unsustainable development over the last century and longer, been persecuted in culls; calls for culls; entangled, choked, impacted with coastal and ocean debris; afflicted by pollution, starvation, disease and propeller strike; most latterly are among the earliest casualties and heralds of climate change and more and yet continue to survive. Would that we could see ourselves through their eyes. Volunteers to the Irish Seal Sanctuary and first responders were evolving to planetary healing. In their simple human responses to vulnerable wildlife in distress, they were learning and developing much needed skills and awareness of the fragility of our environment and our own vulnerability. They progressed from the 3Rs of Rescue, Rehabilitation and Release to develop an approach to wildlife in a marriage of conservation, welfare and public engagement. From humble beginnings the ISS legacy is an ever more sophisticated response and skill set among our vets and 1st responders; a growing body of researchers expanding into marine environment from starting point with seals; funded, developed and improving facilities around the coast for marine casualties; an advisory and advocacy role in sustainable fisheries, coastal communities and ecotourism; and enhanced profile for seals from politically toxic position of yesteryear. Don’t shoot the messenger? And now, the ISS in some respects displaced by commercial interests but faced with ever growing demand for services not commercially provided, needs a home of it’s own from which to develop a free access visitor facility for people of all ability to learn, engage and pursue opportunities with marine wildlife and environment, while residing in our care. Some generous legacies from early supporters of the earliest seal releases have brought a coastal site and home within ISS reach and we now need those brave and impassioned people with the skills and resources to develop it and secure its future. Below you will find 5 episodes of our movie Lanugo. Take a few moments to watch these and understand the vision which motivates ISS.